Ali Pfleger caught this 96-kilogram (211-pound, 11-ounce) Pacific bluefin tuna (Thunnus orientalis) while fishing off Southern California on August 16, 2018 aboard the Hana Pa'a. 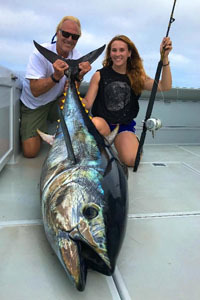 If approved, the catch will earn Pfleger the new women's 15 kg (30 lb) line class world record, which currently stands at 53.3 kilograms (117 pounds, 8 ounces). 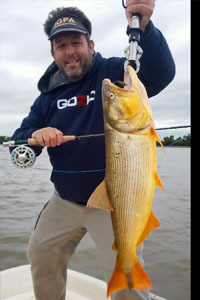 IGFA Representative from Argentina Juan Pablo Gozio potentially set the new men’s 1 kg (2 lb) tippet class world record for dorado (Salminus brasiliensis) with this 3.63-kilogram (7-pound) fish that he caught and released on June 23, 2018 while fly fishing out of the Rio Lodge in Argentina. The current world record in this category is 1.87 kilograms (4 pounds, 2 ounces). 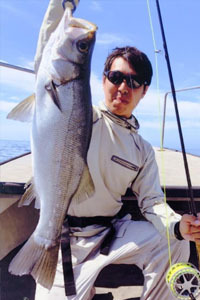 Japanese angler Takuro Fudetani caught and released this 3.5-kilogram (7-pound, 12-ounce) blackfin seabass (Lateolabrax latus) on June 22, 2018 while fly fishing Japan’s Nishisonogi Peninsula. If approved, the catch will earn Fudetani the new men’s 2 kg (4 lb) tippet class world record, which currently stands at 2.5 kilograms (5 pounds, 8 ounces). 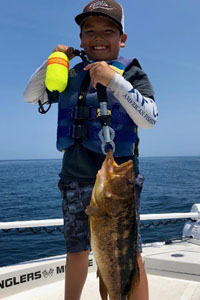 Angler Cayden Matro – age 10 – caught and released this impressive 3.4-kilogram (7-pound, 8-ounce) kelp bass (Paralabrax clathratus) on August 11,2018 while fishing off San Clemente Island, California with his father. If approved, the catch will earn the young Matro the new Male-Smallfry world record, which currently stands at 2.83 kilograms (6 pounds, 4 ounces).